Moet and Chandon, or Moet et Chandon as they say in France, is a remarkable and enormous producer. They have over 18 miles of cellars in Epernay, own over 1000 hectares of vineyards (and they still buy 80% of their grapes), make about 26 million bottles a year, and they produce near oceans of the most popular prestige cuvee in the world, Dom Perignon, which deserves its fame, drinks well young, and ages very well too. OK, so it's massive, but are their wines good? It's popular these days to bash anything big, and as the expression goes, "Small is the New Big." Their prestige Cuvee, Dom Perignon, is extremely good, quite impressive indeed. Their vintage wines are consistently very good, and their others? They range from decent to quite good. In other words, quality throughout their range of offerings. They are not however without mishaps, and I personally believe they never should have made Dom Perignon in 1992 nor 1993. The wines aren't bad, but not up to quality as those were not great years fro growing grapes. However with the upcoming Millennium celebrations and supposed Champagne shortages, many producers bottled prestige cuvees they should not have. And Moet's taste or house style? I'd describe it as medium bodied and fresh. This is available in Non Vintage (NV) and Vintage varieties, and their NV Brut Imperial is simply the biggest selling Champagne in the world. It's medium dry and toasty and usually improves with a year or two of aging. It is primarily comprised of Pinot Noir and Pinor Meunier, with just a little Chardonnay. The Vintage is a definite step up and often contains a higher percentage of Chardonnay. I always try the specific vintage before buying bottles for cellaring as it can vary quite a bit in quality from year to year. They also make a vintage and non vintage version of Brut Imperial Rose, and the NV is quite a good Rose with about equal parts of Pinot Noir, Pinor Meunier, and Chardonnay. Once again, the vintage is a step up and the same comments above about the vintage Brut Imperial apply. 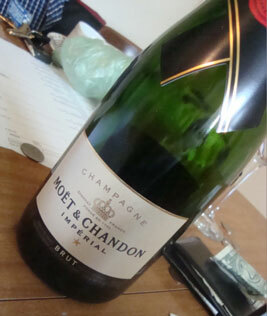 The NV Moet and Chandon White Star is my favorite NV from Moet and is extremely popular in the USA as well as Hong Kong. It is similar to the NV Brut Imperial but is not as dry. It is an easy drinking and tasty Champagne, widely available in the USA, and often on sale. I bought magnums recently for about US$60. This is a much sweeter Champagne and good for having with dessert. Not many sweeter Champagne are made anymore, but remember that Champagne was originally all quite sweet. It not cloyingly sweet and I'm glad they make this! Of course this stuff rocks, and it is named after Dom Pérignon, a Benedictine monk who is widely credited with inventing Champagne although supposedly this is not true. He did some important work in improving the quality of Champagne however, and no doubt drank a lot of it. The first vintage was 1921 which was released for sale in 1936. It is a very long lived wine. Moet was established by Claude Moet in 1743 and in 1832 when his son in law joined, the name Chandon was added. The history of Moet and Chandon is fascinating, with plenty of royalty drinking loads of their juice including Napoleon who was a massive fan, Napoleon's father in law (the Emperor of Austria),Tsar Alexander II of Russia, the Duke of Wellington, Queen Victoria, and the Prince Royal of Prussia. We'll also add myself and The Champagne Poodle as massive fans, especially of Dom Perignon. The best writeup on the history of Moet and Chandon I've seen is at Wikipedia. If you get the chance you should tour Moet and Chandon - reservations suggested. They are perhaps the best designed Champagne House for receiving visitors. Prices start at 15 Euros for adults and include a flute of Champagne. Tours are available in French, English, German, Mandarin, Dutch, Italian, Spanish, Portuguese, and Russian, but sadly not Greek, my mother tongue. Moet & Chandon is now part owner of luxury goods company LMVH (Moët-Hennessy • Louis Vuitton), and the Paris based company also includes Champagne producers Krug, Veuve Cliquot, and Mercier, as well as Château d'Yquem, perhaps the best sweet wine on the planet, California sparkling wine producer Domain Chandon, some great Scottish Whisky makers, and more. Bought and drank the same night from the New Hampshire Liquor Stores. I'm willing to bet it would easily improve with 6 to 12 months of age too. The nose has orange, chalk, a little lemon, and minerals. Citrus fruity with some toasty tones. It has a creamy body with orange, apple, and a wonderful tropical mouthfeel of nice rolling citrus flavors playing off of the accompanying minerality. About $38 and extremely widely available and the biggest selling Champagne on the planet. Part of the first flight of Rose Champagnes at Blanchards Holiday Wine Tasting, Dec, 2011, Allston, Mass. At 13-14 years old this is still a baby. The color, as you can see, is a copper/apple cider with pink tones. The nose is massive and animalistic, with meat, some sweat, and a little yeast. On the palate, it's massive and mouth filling, with candied rocks and minerals, caramel, and deep hidden fruits. Truly magnificent, and if not at a tasting I'd definitely pair this with food. Bravo, this wine rocks and shows that the Dom Rose is truly a magnificent wine, even in 1998 which is a very good but not great year. At the end of the tasting, I immediately poured myself a big glass as some was left. We are talking US$300 a bottle for this wine, and it delivers.